This made to measure men's leather shirt is the perfect choice due to its traditional detailing. The leather shirt is inspired by the look of leather coats with its silver snaps that run along its center panel. 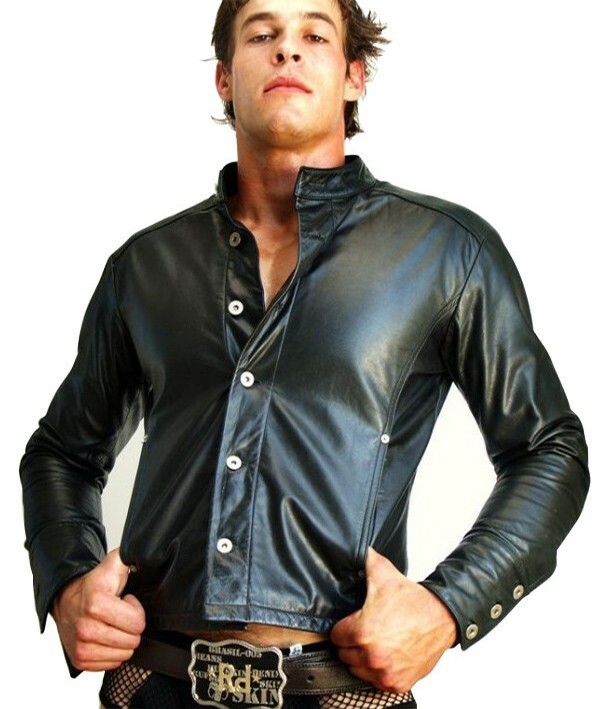 Searching for a men's leather shirt with a classic fit that brings to mind the clothing of both bikers and rock stars? This made to measure men's leather shirt is the perfect choice due to its traditional detailing. The leather shirt is inspired by the look of leather coats with its silver snaps that run along its center panel. A stand-up collar complements the front of the shirt and keeps the visual emphasis on that snap-down panel. Long-sleeved, the shirt features classic broad cuffs, and it is sized to fall to the hips. We will make this shirt to your exact sleeve and chest size requirements out of the best quality genuine leather in your choice of eight high fashion colors. You can make special requests for extra customization.